? (2014). 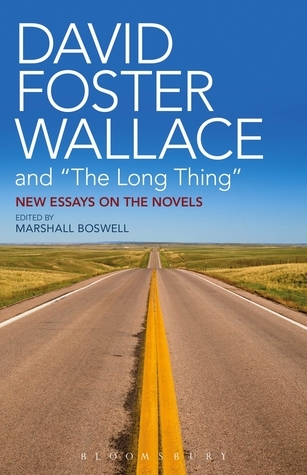 David Foster Wallace and "The Long Thing": New Essays on the Novels. Bloomsbury Academic. Bloomsbury Academic, 2014. 272 pages. Preface: David Foster Wallace and "The Long Thing"
DFW had 9 books published at time of death. 3 story collections: GCH, BI, O; 4 nonfiction: Supposedly, Consider, Signifying, Everything and More; 2 novels: IJ, Broom. 3 posthumous: TPK, Flesh, This is Water (FTL not mentioned; doesn't count as a book I guess). many of the essays here are from the 2011 Wallace conference in Belgium, organized by Toon Staes. on DFW being a novelist of ideas. most criticism refers to the essay-interview nexus of E Unibus Pluram & the preceding McCaffery interview. mentions his Dostoyevskian influences. centered about three pieces of dialogue: LaVache and Lenore talking about Gramma on the hill; Marathe talking about freedom-to vs freedom-from; section 19 of TPK and what it says about DFW's own beliefs (in finding a moral system in a moralless landscape, and moving beyond politics). exploring various narrative models in TPK and IJ: Contracted Realism (not really sure; a form of realism telling us new things about the world around us?) and Spontaneous Data Intrusion (random intrusions of data, or two elements of the narrative cutting into each other, as often occurs with Sylvanshine), in TPK ; Argot (creating a community via argot; references Wittgenstein) and Free Indirect Wraith (James Incandenza visiting Gately) in IJ. i don't really know what the main point in identifying these narrative models was, though. he never goes anywhere with them, other than to conclude that "Pale King and Infinite Jest aren't themselves communities; they are gestures to community, and to its limits". the history of boredom (acedia, melancholy, ennui, etc); how TPK documents a variety of boredoms (the existential, the quotidian, that arising from neoliberalism). he talks a lot about boredom and neoliberalism (cites David Harvey's Brief History of Neoliberalism and quotes its definition), and gives some political and historical context for Chris Fogle's chapter + Spackman stuff. on how giving in to boredom is irresponsible and childish; instead we must transcend it. it may be boring to pay attention to things other than the self, but if we want to find relevance and meaning, that's where we'll find them. Paying attention, boredom, ADD, Machines vs. people at performing mindless jobs. Being individual vs. being part of larger things--paying taxes, being "lone gun" in IRS vs. team player (545).